ABTEY CHOCOLATERIE S.A.S. 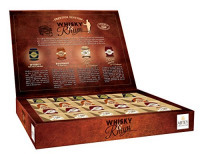 Prestige Edition Whiskey and Rum, 200 g - ABTEY CHOCOLATERIE S.A.S. With their beautifully boozy taste, a treat from this Abtey Whisky and Rum Dark Chocolate Liqueur Assortment is the perfect way to warm up on a cold winter's night. Made from premium dark chocolate, each little foil-wrapped barrel is filled with a delicious full-strength liqueur: try Scottish pure malt whisky, Kentucky bourbon, and white or dark rum from Martinique. Produced by a third generation family business located in Alsace, France, these liqueur chocolates are made traditionally, without a sugar crust, and with rich dark chocolate which enhances the flavour of the high quality liqueur inside them. They make an enjoyable after-dinner treat, and are a wonderful gift to take to a dinner party. Founded in 1946 by Henry and Amelie Abtey in the heart of Alsace, and still very much a family affair, three generations on, the Abtey family still use time-honoured traditions, using fine chocolate and quality liqueur to create their adored gourmet recipes.